This example of the restoration process features a really awful condition T47A/ART-13 (aka: AN/ART-13A) that was part of a trade-deal. Missing parts, extensively disassembled and cosmetic condition issues make this an excellent example to illustrate the types of problems involved with the restoration of "Basket Case" projects - and, perhaps, why to avoid them. The Big Trade - The photo to the right shows the USAAF T47A/ART-13 that I got in a trade. The fact that it was almost completely disassembled didn't matter since it was initially considered just a "parts set" to use for the restoration of another nearly complete US Navy Collins T-47/ART-13 that was also included in the trade. I know,...you want the story about the trade, right? 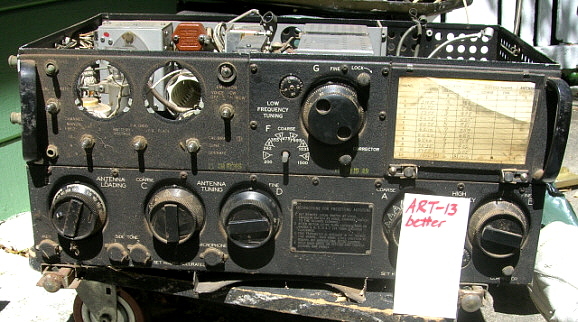 I got an e-mail offering two "rough" ART-13 transmitters, a "nice" BC-312 receiver and an "okay" BC-344 receiver plus several boxes of military radio parts in trade for audio gear or a tube tester. After a couple of e-mails we settled on trading a nice, working Hickok 600A tube tester and a "needs restoration" HP-712A power supply for a "load" of military gear that included the two transmitters and the two receivers. Photos were sent both ways and we both knew the condition of everything involved in the trade. A quick daytrip to Lafayette, California resulted in dropping off the tube tester along with the HP power supply and coming back home with my Subaru Outback packed full of military equipment and parts. First Things First - The first project was to restore and get operational the Navy T-47/ART-13. This project took a about seven weeks to complete, which included designing and building a suitable power supply for the transmitter. I began using this T-47/ART-13 a lot and really enjoyed operating it. I didn't really consider even looking at the other ART-13 transmitter because it was a "basket case" and only a source of parts. Then, a few months later, fellow ART-13 enthusiast, W7MS, happened to mention "on the air" that he had a second ART-13 in storage that was his "hanger queen." This got me thinking that I probably could take my "parts set" and put it together enough to be a "hanger queen" that would be "for display only" in the Western Historic Radio Museum (the museum I had in Virginia City, Nevada 1993-2012.) Functionability wasn't the goal, just a fairly complete, reasonably good-looking ART-13 for a museum display. photo above: The ART-13A after the "parts hunt" located most of the missing parts. The Parts Hunt - As I searched for the parts I was finding boxes that had been picked up at the Big Trade but that I hadn't really looked in carefully. Looking through four large boxes turned up all of the sheet metal parts. I looked through more of the smaller boxes and plastic bags finding nearly all of the components that were missing. I began to think this project might progress from "hanger queen" to "restore and get it operational." After a thorough search I ended up with a pile of parts that looked like the photo to the left. In the photo, all of the sheet metal parts were just setting in place, so I could see that I had all of the pieces. Note that the combination bottom cover and shock mount rails isn't even in place but is leaning up against the side of the transmitter. No amount of searching could find these missing parts: R-121, R123 and R-124. These are the wire wound resistors that are located in the rear compartment with the 811s and the 813. Additionally, the rear triangular bracket that supports the side panel for the blank panel couldn't be found. The MCW/FCI module and the Audio module "remains" had been sometime in the past totally disassembled for parts and I could only find the chassis and a few parts to those units. Also, the multimeter was unusable due to a broken glass that long ago had allowed the meter needle to become broken. Everything else that had been removed from the transmitter I was able to find in the various boxes of parts. This meant the transmitter was about 95% complete, just mostly disassembled. In my "junk boxes" had two spare MCW/FCI modules so that wasn't a problem. KØDWC supplied the triangular bracket by giving me an entire blank panel assembly. I purchased an Audio module off of e-Bay. 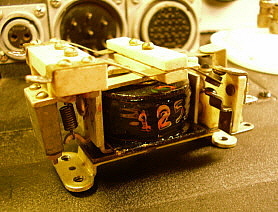 The meter and the wire wound resistors were obtained from Fair Radio Sales. So now, on to the restoration work. Unusual Reassembly - The most difficult to repair damage was the three flexible plate cap connections (E-109B) for the 837 VFO tube and the two 1625 multiplier tubes. These consist of a flex connection and a brass tube that is soldered to a stud that is mounted through a pair of ceramic standoffs (top and underneath the chassis.) These three connections were "snapped" off leaving the stud inside the brass tube and a flush threaded rod with a nut on top of the insulator. After trying to drill out, tap and other methods that didn't work, I decided that I should solder a flange to the brass rod and then sweat-solder that to the nut on top of the insulator. This worked quite well and seems pretty strong. To reconnect the large buss wire connections for the LF relay (K-105) and the Antenna push connectors I made brass sleeves out of shim material. 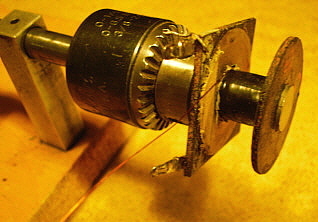 These cylindrical sleeves were fitted to the cut buss wires and then soldered. The buss wires had to be re-tinned first and it does take quite a bit of solder to fill this kind of splice. The benefit is that it's a really strong joint and it looks like a professional repair job. See photo right. The Interlock switch had the housing broken. Fortunately, it was possible to use epoxy to repair the housing and get the switch working again. Also, the mounting for the plate blocking capacitor used a pair of fiber screws into the ceramic standoffs and since one of the fiber screws was broken, I repaired the mount using epoxy. A Wiring Error? - During the reassembly of the meter/switch panel I had to re-install the meter shunts and loads that are mounted with a long screw to a projecting tab that is on the back side of the right side inner panel. In checking the wire locations versus the schematic I discovered that the Meter switch had a wiring error. This was INCREDIBLE since it meant that the positions for Grid Current and Battery Voltage couldn't have worked. I used the wiring diagram (not the schematic) to confirm this was indeed an error. I think this must have been a later error done during a repair cycle that replaced the meter switch. It's likely that the transmitter didn't pass one of its tests after the rebuild and was set aside for a later checkout and repair cycle that was never done. The wiring error might have happened at SAAMA. The San Antonio Air Materiel Area (Kelly AFB,) performed extensive aircraft repair and repair of all aircraft equipment from 1947 up to 1974. 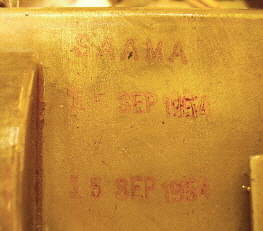 This ART-13A has a SAAMA stamp for MFP application dated 15 Sept.1954. It's likely this ART-13 never made it out of the repair depot and was sold as surplus at some later date. The error was the interchange of two wires going to the Meter switch that introduced a conflict between the Grid Current and Battery Voltage. After switching the two wire positions, the meter then read Battery Voltage and Grid Current correctly. It's unlikely that this problem would have gone unnoticed, so why it wasn't corrected at SAAMA is a mystery. The photo left shows the SAAMA MFP stamp on the chassis. Replica Calibration Book Pocket - The Calibration Book pocket was missing from this ART-13A. It appeared like the rivets were aggressively pulled out since the metal was slightly distorted. I took measurements from the USN T-47 that had its original book pocket and had a replica made at a local sheet metal shop. I had to add the curved cut-out and the edge treatment since this would have complicated the project for the metal shop. Once I had the piece shaped correctly, I had to remove the Autotune cover so I could accurately measure where the mounting holes had to be drilled. Also, there was some "body work" necessary to get the holes in the cover cleaned up. A close inspection of the original book pocket revealed that the inside was painted gloss black and the exterior was black wrinkle. The original wrinkle finish paint was a two part process that used a catalyst sprayed onto nitrocellulose lacquer to activate the wrinkle by baking in an oven. 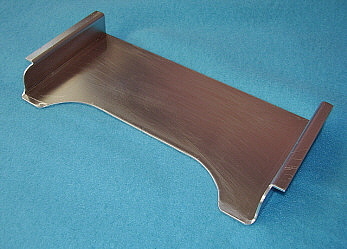 It's normal for older sheet metal pieces to be gloss on one side and wrinkle on the other. I painted the pocket with gloss black lacquer on the inside and Krylon Black Wrinkle Finish on the exterior. The original book pocket was mounted with round head rivets. Fortunately, I had the same kind of rivets in one of the parts drawers around here. The rivets are a tight fit and when the shaft part is deformed it pulls the mounting flange tight. The three photos below show the various stages of making the replica book pocket and the larger photo to the right shows the pocket mounted on the ART-13A. I still need to make the replica plastic tubing covered chain that attaches the book to the book pocket. A small hole at the lower right front corner of the pocket has a rivet/washer combination that holds the one end of the chain and a lanyard ring attaches the chain to the book binder ring. See updated photo at the end of this section showing the book, chain and ring installation. Cosmetics - As can be seen in the "before" photo above, the panels did have some aluminum corrosion that was "popping" through the paint. I used the method described in the restoration section above to touch up the panels. This ended up with a combination of touch up and then using the "wash" technique. This resulted in the panels looking kind of flat but even and with some wrinkle to the finish. See the "after" photos below. 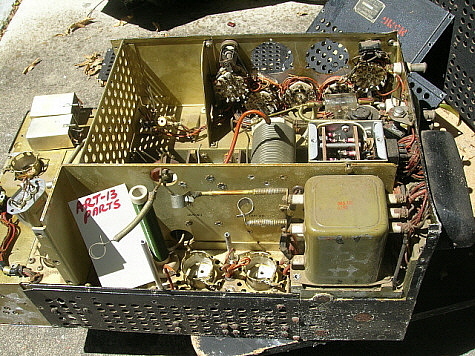 Since so much of this ART-13A was disassembled and parts were obtained from other transmitters to complete its assembly, the distinctive "gold" color of the MFP coating had to be applied to many parts. Probably the most difficult to match was the replacement Audio Module since this was a large piece that didn't have any MFP coating when obtained. Fortunately, I had a few parts from the original Audio Module to see just how much MFP was on it. Quite a few years ago, I had some yellow-tinted nitrocellulose lacquer mixed for me. This is very close to what MFP was except it doesn't contain a fungicide or that distinctive MFP odor (darn.) I thinned this yellow lacquer down using clear lacquer and lacquer thinner to get the correct "look" of the MFP when sprayed onto the Audio Module. >>> >>> All of the other pieces that needed to be MFP coated were small - like screw heads and nuts, solder joints, sheet metal edges, etc. This was applied with a small paint brush direct from the tinted lacquer can. Looking at the finished chassis photo below shows the final appearance. A new Settings Chart was necessary and an excellent one can be down loaded from BAMA. Just print it out on heavy manila paper and it will look original. New plastic for the chart can be found many places. I salvaged the plastic from a cheap picture frame. Final Missing Parts Installation - The large wire-wound resistors, R-121, R-123 and R-124, were obtained from Fair Radio Sales. Luckily, when the originals were removed the wire must have been cut close to the resistor terminals because I did have enough wire left for the connections to the new replacement resistors. These large wire-wounds mount with an aluminum stud that is threaded on each end. The stud is mounted to the chassis with a screw and lock washer from underneath the chassis. Then several mica washers are placed over the stud and next to the chassis. Then the resistor is placed over the stud and secured with several more mica washers, a flat steel washer, a lock washer and finally a screw. Without R-121, you can't do any real "voltage on" testing because the +28vdc to the filaments is routed through this 0.8 ohm 50 watt resistor first. With the installation of these resistors the filament circuit is complete and testing can begin. Testing - I tested both the MCW/FCI module and the Audio module by plugging them into my working Navy T-47/ART-13 to confirm they were operational units. The MCW/FCI module worked fine but the Audio module needed extensive repair (what else can you expect from an eBay purchase?) Two resistors had to be replaced. The audio input resistor had overheated and the value changed along with burning off part of the color code paint. The carbon mike Z load resistor had been changed from the original value of 15K to 4.7K (a common upgrade found in later modules that increases the mike bias for better response from typical carbon mikes.) I reinstalled a 15K resistor (just to be original.) A quick operational check showed that I still had some distortion that resulted in "harsh" sounding audio. The problem was caused by a defective coupling capacitor between the 12SJ7 plate and the 6V6 grid (C-204.) Since this was one of a "stack" of three molded capacitors (and one other capacitor already had broken mounting tabs,) I went ahead and replaced all three caps with SBE Orange Drops. Additionally, it was noted that the Jones plug was partially coming apart due to a bent over tab not holding the back plate in place. After several attempts to remount the back using the tab, I finally had to resort to a combination of epoxy and the tab to hold the backing plate in position. After these repairs, the Audio module output sounded great. Pre-Testing - During the re-assembly of this ART-13A most of the sections that were affected by the disassembly were tested. A thorough inspection is necessary before powering up any transmitter. All components that could be tested with a DMM were given a cursory test. Be sure to test the Plate Blocking capacitor for shorts since this condition would allow for full +HV to be on the antenna system. All tubes are tested except for the 813 which can be given a quick filament continuity test and a quick shorts test with a DMM. Clean all the ceramic insulators. Initially, I just connect +28vdc and make sure all of the low voltage circuits work. This test turned up a problem with the Autotune. Through the system would motor drive to the zero position it just remained at zero and would not continue onto the presets on any channel selected. Since the Autotune essentially wouldn't shut off, the transmitter couldn't be tested further until this problem was fixed. Autotune Problem - I guess this transmitter was pretty much a basket case for quite sometime and the front cover was off of the Autotune mechanism. At that time the Forward Limit switch was hit or bent enough that it wouldn't open when the actuator arm contacted it. Momentary breaking of the contact would cause the Autotune to complete its cycle. I bent the contact arm just enough so that the contact would open at the Forward limit position and reverse the motor to complete the cycle. This got the Autotune working correctly. +HV and +LV Test - When everything looked ready, I decided to go ahead with a full test. With the +28vdc on operation was normal and I allowed the tubes to warm up. After a few minutes, I switched to TUNE and pressed the THROTTLE SWITCH (T.S. jack - a remote PTT line.) This resulted in the immediate blowing of three fuses in my power supply. Two fuses were the primary fuses to the +HV and +LV transformers and one fuse was the +HV output. Since my power supply is fully fused in every input and output, no damage occurred there but certainly something was wrong the the ART-13A. Problem One - The PTT line was grounded. This caused most of the problems involving the +400vdc. I traced the source of the problem to a solder bridge that I created when reinstalling K-104 - oops. Removal of the solder bridge cleared the PTT problem and the ART-13 would now operate and not blow the +400vdc fuse in the power supply. Problem Two - The +1400vdc continued to blow both the transformer primary fuse and the output fuse in the power supply. A close inspection of the 813 tube socket revealed a burnt R-112, a 47 ohm 1 watt carbon resistor acting as a screen load. I replaced R-112 with an NOS resistor but wasn't too confident that it was causing the problem. I decided to also replace the old National Union 813 I had been using with an NOS Sylvania 813. These two changes got the +1400vdc and the transmitter operational and working fine. The Initial Shake Down Test - This test used my homebrew power supply that I normally use to power the Navy T-47/ART-13 to power this T-47A/ART-13 version. This supply provides about +1400vdc for the +HV and results in about 160 watts output with the Navy transmitter. With the NOS Sylvania 813, this ART-13A had a somewhat higher output power running around 190 watts. I decided to use a variable capacitor (instead of a fixed value capacitor) for the Auxiliary Condenser so I could load the antenna exactly. This setup allowed me to adjust the ART-13A for about 200mA total plate current and have a power output of about 145 watts. This allows the transmitter to run in a very stable manner since the power supply current carrying capabilities are not "pushed" and the +1400vdc plate voltage remains fairly constant during operation. The reduced power also allows for easy 100% modulation without "loading down" the plate supply (which was what was happening at 190 watts output.) Monitoring with earphones listening on an RCA CR-88A (with no antenna connected) sounded great. Watching the oscilloscope looked great. The next test was to call up KØDWC and have him listen to the signal at his station (next block up the street.) With this set-up, I can also hear what Chuck hears via the telephone connection. 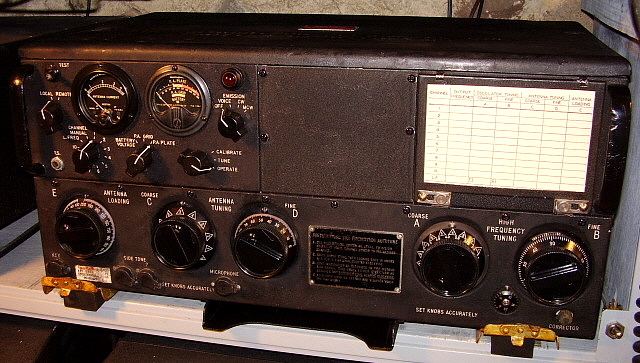 Finally, a true "On the Air" test with the Sunday morning Vintage Military Radio net was next (3974KC - 8AM Pacific Time.) The "On the Air" test was successful and the reports that came back were all positive. photo left: The chassis of ART-13A sn 417ACG after restoration. 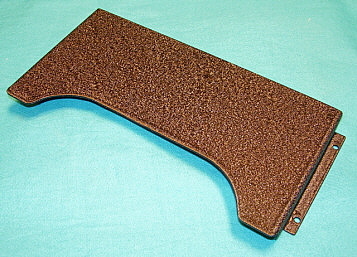 Note the distinctive "gold" appearance from the MFP coating. CW Mode Inoperative - This problem was actually found after I had used the ART-13A "on the air" in the VOICE mode. I decided to try some 40M CW with the ART-13A and after loading up in the VOICE mode, I switched to CW. When switching to the CW mode, the transmitter should show plate idling current and when depressing the key the plate current should increase up to slightly less than the VOICE plate current (since you don't have the Modulator idling current.) No idling current was showing on the meter and when the CW key was depressed the keying relay operated but no plate current was indicated. A quick check of the schematic showed that the problem was most likely in the operation of the CW relay, K-103. 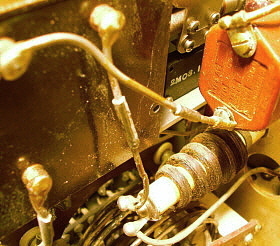 A quick check accessing the K-103 relay coil terminals for testing through the vent holes in the rear panel of the transmitter showed the coil was open. An original replacement K-103 would involve quite a bit of time to locate. Since rewinding the coil of the relay wasn't really too difficult, I decided to proceed with a repair instead. 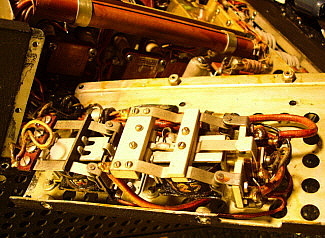 First, to access K-103, the transmitter bottom had to be removed. Then the bottom-rear panel can be removed and the two relays, K-103 and K-104 are mounted on the inside of that panel. I tagged all of the wires soldered to the 10 terminals on K-103 to make reinstallation easier and then unsoldered them and dismounted the relay. The relay coil is held in place with a single screw. Once the coil is out of the relay, then all of the original magnet wire has to be removed. By the way, the "break" in the wire never seems to be at the beginning of the wind. I just cut all of the original wire out with an Exact-O knife and remove it with needle nose pliers (or my fingers.) I measured the thickness of the original wire so I would know what gauge magnet wire I would need. The original seemed to be 33 gauge but all I had on hand was 32 gauge. >>> >>> I used a motor driven coil winder I had built about 30 years ago. It's very basic in design and uses a "light dimmer" control as a motor speed control for the small sewing machine motor. This allows me to wind a solenoid-type coil pretty fast. I threaded an 8-32 stud into the tapped hole in the coil spool so I could install that stud into the chuck of the coil winder shaft - see photo below. You have to start the winding slowly and this is where a variable speed motor control is really necessary. Once the motor speed is about 100RPM, it is easy to just use your fingers for tension and to also guide the wire onto the spool. When it appears that the coil is about the proper dimension, I stop the motor and clean a spot on the wire so I can measure the DC resistance from the "inside" terminal to the clean spot - this would be the total DCR of the coil so far. I'm looking for around 125 ohms DCR and when that is achieved, the coil is finished. After the coil was wound, I wrapped it with black electrician's tape and then lacquered the exterior of the coil. The original coil had "125" stamped on the side, so I added that to this replica coil and then mounted it back in the relay. Operation was just like an original relay. Resoldering the wires to the relay was easy since all of the wires were tagged and their proper location readily found. After all the wires were connected and soldered, I coated the solder joints with the yellow-tinted lacquer to simulate MFP coating. Below are photos showing four of the steps to completing the repair of K-103. Testing the CW Mode - The ART-13A was put back into the operating position and connected back up to the station antenna system. My initial test was on 3974kc, our Vintage Military Radio Net frequency, but since it was mid-day there would be no activity. This test showed that the ART-13 did indeed function in the CW mode now. The next test will be an actual CW QSO on 40M. photo above: Coil spool in the chuck - ready to wind. 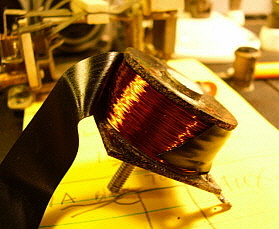 photo above: The coil after winding. Final Assessment - It's hard to believe that the ART-13A in the photo to the right is the same "parts set" shown at the beginning of this section. Though this ART-13A turned out really nice and works great, let's consider what was necessary to get the transmitter operational. First, I had to find an Audio module - $67 with shipping off of e-Bay (and I had to repair/restore it.) A set of three wire wound resistors - $45 from Fair Radio. Plate Meter - $35 with shipping, Fair Radio. The MCW/FCI module that was a spare had been purchased earlier for $30. The sheet metal piece was $21. The total for missing parts was $198. Luckily, I didn't have to buy any tubes. In addition to that, figure that I had to spend about two weeks putting the transmitter together and getting it operational. I still have to build an AC operated power supply specifically for this transmitter. Of course, I did essentially get this ART-13A as a "freebie" that was included as a "parts set" for the Navy T-47. So, I started with a "zero investment" but, as far as saving any money on this project - that didn't happen. Unless you really enjoy all the aspects of restoration - parts hunting, cosmetic restoration, mechanical reassembly, testing, troubleshooting and repairing, it's probably best to avoid these types of "basket case" projects. The positive side is, of course, "bragging rights" to having saved another ART-13 from the oblivion of the scrap heap. photo right: The ART-13A sn 417ACG after completion of the restoration. Note that the two meters don't match. This is commonly found on many ART-13 transmitters and is probably due to past depot repairs, however, in this case the Plate meter is a replacement acquired from Fair Radio Sales. 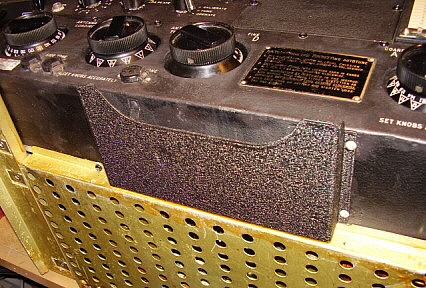 photo above: This is the ART-13A "Basket Case" as it now looks in 2013 in our Vintage Military Radio station in Dayton, Nevada. 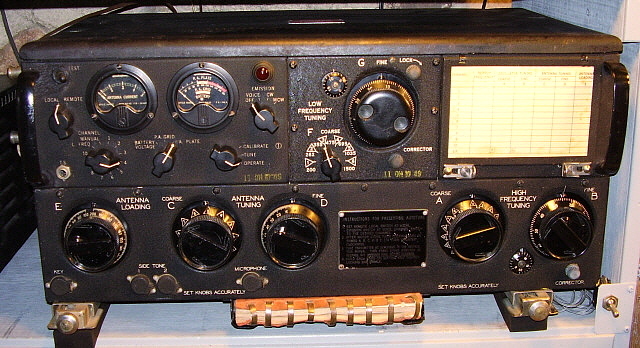 This configuration with the BC-348-R receiver would be referred to as the ARC-8 but to be accurate that ARC-8 should be powered by dynamotors and this station actually is using AC power supplies for both receiver and transmitter. Note the auxiliary capacitor to the left of the ART-13. This air variable capacitor allow precise setting of the loading of the transmitter. 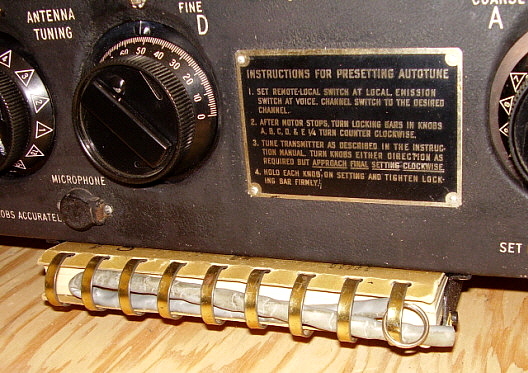 Details on the construction of an auxiliary capacitor box is in the section below "Operating the ART-13 on the Ham Bands Today." Note that there is now a Calibration Book in the book pocket along with the correct type chain and sleeving for securing the book to the pocket. Also note that all of the panel screws have been changed to stainless screws along with using external star washers. Most ART-13A transmitters that I've worked on seem to have stainless (or at least silver finish) screws with external star washers rather than the "raven finish" (black) screws and internal star washer used on the earlier Collins' versions. I was also able to remove some other items needed from a "parts set" ART-13 that belonged to KØDWC. The original Instruction Plate on the lower front panel was in poor condition but the "parts set" had one in nice shape. If you carefully drill the back of the rivets just enough to remove some of the rim they can be "punched out" with a small metal punch. This saves the rivets for reuse. The new Instruction Plate was mounted by installing the old rivets and then deforming the back of each rivet with a suitable punch. The front of the plate and the rivets have be held against a piece of hardwood to keep the rivets tight while punching. To fully secure the plate, use clamps to make sure the plate and rivets are tight against the panel and then apply a small drop of 5 minute epoxy to the back of the rivets. When that's cured, the plate will be secure and tight along with looking perfect. I also replaced the mismatched meters with a set of matched Weston meters from the "parts set." Also, the original K-103 that I repaired was replaced with a good condition, functional K-103 unit from the "parts set." Also, the old "repaired" Interlock switch was replaced with a good condition, functional original. I was given the OA-17 LF Oscillator as pre-payment for some work on a T-368 transmitter that is owned by KØDWC. The OA-17 just about completes this ART-13A "Basket Case" with the only other item needed being the shock mount. USN/Collins T-47/ART-13 "Restoration of a Typical Example"
This example of the restoration process features a very complete, good condition ART-13. Only minor disassembly and only one missing part made this restoration straight-forward and is typical of most ART-13 restorations today. Deceiving Appearance - The photo to the right shows the other ART-13 involved in the "Big Trade." Though it looks to be another "parts set" it's actually in pretty good shape. With this Collins-built USN T-47, all of the parts were present except for the MCW/FCI module. The obviously missing meters were carefully wrapped in bubble-wrap and in one of the parts boxes. 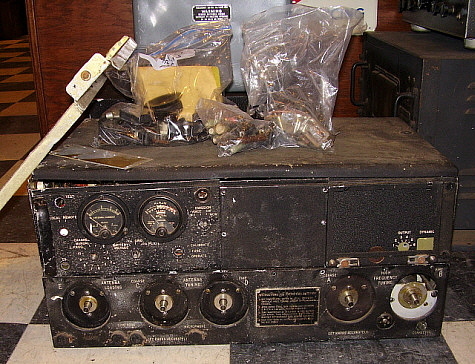 Knobs, the lid, and other minor items that were not on the transmitter were in the boxes. The Audio Module was partially disassembled but this was minor and only involved replacing some screws and nuts. Tubes were carefully wrapped in one of the parts boxes. I found a MCW/FCI module off of eBay. These are usually pretty cheap with this one costing $15 plus shipping. Reassembly and Body Work - This transmitter required the same sort of searching through the parts boxes but on a much smaller scale. All of the parts were easy to find since they were obvious items that were very recognizable. Note that the handle on the left side is bent. Actually, the sheet metal panel is bent. This required removing the handle and using a clamp and small wooden blocks to straighten. Even doing this carefully resulted in some of the paint chipping off. The area was painted with Krylon Black Wrinkle Finish using a small brush. Then the area was heated using a heat gun to activate the wrinkle. After the wrinkle had dried overnight, I matched the actual color of the panel with Artist's Acrylic paint. Everything needed a good cleaning. I used Glass Plus for most of the cleaning. The wrinkle finish was cleaned using a soft brass brush and Glass Plus. Afterwards, Armor All was used to improve the looks of the original paint. The knobs were soaked in dish soap and water for about an hour and then cleaned with a tooth brush. Armor All can also be used on the knobs. photo above: This USN T-47/ART-13 is actually a pretty good candidate for restoration. An added bonus is the Navy version of the OA-16 LFO is installed. It looks pretty bad in this photo but all of the parts were in boxes and the transmitter only needed to be reassembled. Power Supply Construction and the Amazing Nemic-Lambda - I built a power supply entirely out of my junk boxes. It was a pretty standard for a tube rectifier design and used 866MV rectifiers for the +HV and a 5U4GB for the +LV. The unusual approach was to use a modern and very small Nemic-Lambda 10A power supply for the +28vdc. I saw this supply on eBay with a "Buy it Now" of $25. I couldn't resist the price so I purchased it. When it arrived I thought I had been sent the wrong item. It was about 3 lbs total weight. The size was 4"W x 4"T x 9"D. Nothing that small could provide +28vdc at 10A! A set-up and test proved to me that modern switching power supplies are amazing. I monitored the output with an oscilloscope and was amazed that the ripple voltage never changed from minimum load to maximum load. I left the Nemic-Lambda running the ART-13 +28vdc requirement for one hour with no problems and no over-heating. Also, older switching power supplies had a reputation for very noisy outputs with a lot of "switching noise" apparent on an oscilloscope when monitored. This Nemic-Lamba has no "switching noise" on the output whether at full load or no load. Simply amazing. 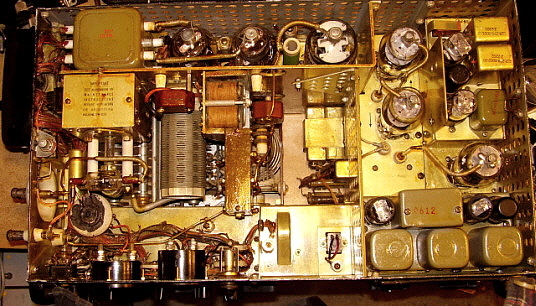 The homebrew power supply is described in more detail in the "AC Power Supply" - "Hommage a le Valve" section of this web-article. Testing - Initial testing showed that this T-47/ART-13 worked with no issues. I was amazed that the transmitter had been partially disassembled and yet went together easily and worked on the first try. Initially, I used a fixed 400pf ceramic external capacitor to allow matching to my tuned dipole. I was able to get about 165 watts output with the transmitter but the audio sounded weak and under-modulated. I had selected the pair of 811 tubes for "matched" equal test results without too much regard for their maximum test readings. The T-47/ART-13 requires 811s that are at least measuring "minimum acceptable" to provide adequate modulation. Replacing these "weak" tubes with better (though not exactly matched) condition tubes resulted in great modulation characteristics. photo above: The completed T-47/ART-13 sn 4628 built by Collins Radio Co. for the USN. Note the rubber mounts that are under each of the shock mount rails. These help to elevate the bottom of the transmitter to provide cooling. 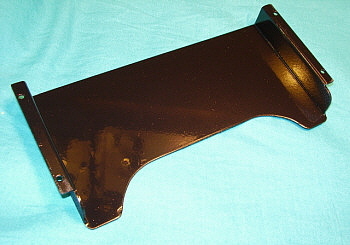 The shock mount rails are the early style that are separate from the bottom cover. Final Assessment - This was the first T-47/ART-13 that I had worked on and restored to working condition. It was a fairly easy project that took about seven weeks to complete, including the design and building of the "Hommage a le Valve" AC power supply. The power supply was actually at least 80% of the time required to complete the project. This is normal in the restoration of your "first" ART-13 since from then on you have the means to easily power-up your next ART-13 projects. At first, I had the Channel Selector switch set to MANUAL while I was learning how the transmitter operated. After a week, I started to setup some of the Autotune channels. I was generally operating on 3870kc or 3974kc and power output was about 160 watts. For audio I used some military microphones at first but discovered they didn't fully modulate the ART-13 at the increased RF power. Although specific mikes are called for in the manual, these mikes seem to only provide sufficient modulation if the carrier power is reduced to around 100 watts. I found that using a DH-50 crystal mike (with a Kobitone element) on an Astatic TUG-8 stand (amplified) provided fully adjustable audio drive with more than enough audio output for full modulation at 150 watts output power. This ART-13 project was fairly easy and no serious problems were encountered. For the most part, if a complete and good physical condition transmitter is purchased, this will give you the best chance of completing the project with very few, if any, problems. UPDATE - Collins T-47/ART-13 - March 2013 - The T-47/ART-13 is now located in the upstairs radio room in Dayton, Nevada. We have set up this ART-13 transmitter to run with the Solid-State Dyna-Sim AC Power Supply which "stacks" a +400vdc power supply and a +900vdc power supply to allow the +HV to run around +1300vdc. This "series" method is how the dynamotor achieves its +HV and the power supply can be built using easier to find parts. The plans for building this type of AC power are below in the "Homebrewing an AC Operated Power Supply for the ART-13." Above the Dyna-Sim power supply is another auxiliary variable capacitor. This air variable has not been painted - yet. I typically run the T-47 with the Shure Bros.102-C carbon microphone to provide the listeners with an authentic "military sound" to the signal. UPDATE - Sept 2017 - This T-47/ART-13 is now set up with a DY-12 dynamotor powered by a PP-1104 power supply. Location is the shop. If you enjoy using Radio Boulevard - Western Historic Radio Museum's website as an information resource and have found our photos, our hard to find information or our restoration articles helpful, then please consider a donation to the WHRM website. A small donation will help with the expenses of website operation, which includes website hosting fees, data transfer fees, research, photographing and composition. WHRM was a real museum that was "Open-to-the-Public" from 1994 to 2012 - eighteen years of operation. WHRM will continue to provide its on-line information source with this website, which has been in operation since 1997.